The birthchart is probably the most interesting thing for an astrological student. Lots of people were involved in astrology due to a strange love to different symbols and mystical signs. We can discern these mysterious symbols by resolving basic models of the chart, to understand what meaning they hide and what should we expect from them on our way. The first thing to know when looking at the birthchart is that it shows the picture from the Earth's perspective or from a geocentric one. Geocentric orientation here happened for a reason. Of course astrologers know that the Sun is a center of our solar system, but we should understand that everything that happens to us takes place on Earth, the place where the life exists, and we watch the celestial processes from similar point of view. The horoscope basically is an image of the planet's location in a determined time and place from the geocentric point of view. Natal astrology is a branch that studies the birthchart of an individual as well as of company or event that is born at a particular time and location. 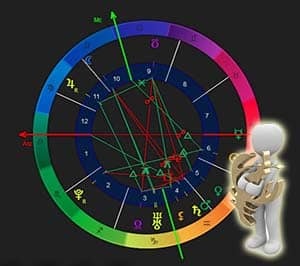 Speaking about the simplest structure of the birthchart, in its middle we can see a circle with a cross inside and the planets around it. The circle is a symbol of the 360° of the zodiac wheel. It consists of the twelve signs of zodiac and the distance between each of them is 30°. The band of zodiacal animals originates from a broad circular path around the Sun through the year. Abovementioned path is called an ecliptic path. As we take into account geocentric point of view, the Sun and other planets move along the 360° pathway, inside of 8° on the each side of the ecliptic (except for Pluto which is 17°), then the 360° of the path are divided into 12 parts 30° each, corresponding to a certain constellation of the similar name. This is a brief description of so-called ‘tropical zodiac' widespread in the studying of the Western part of the world. If you want to find out more, look for our articles on this topic. Twelve zodiacal symbols embody the circle of human evolution. The great power and knowledge are comprised within the zodiacal band. Zodiacal circle contains all astrological charts and gives clear understanding on the motion of the planets. Inside the zodiacal band, constellations are on the same place regarding one another, while the planets are constantly moving around through the 360° of the wheel. The position of the planet regarding to the zodiacal signs is the basic information shown in the birthchart. Every 24 hours zodiac wheel makes a full circle moving clockwise. The starting point is always located to the left from the chart and astrology has a term for it: Ascendant or Rising Sign. The horizon in the chart is symbolized by the horizontal line inside of the circle from the eastern point (Ascendant) to the western point (Descendant).